1. ORAGAN TIROCHE LTD. (U.T.B.) acts as the agent for sellers of items to be offered for sale to the public (` the Sellers` ). 2. U.T.B. will produce a catalog for every sale (` the Catalogue` ), which will include, inter alia, a list of items available at the sale, their serial numbers and price estimates. For the avoidance of doubt, information provided in the Catalogue, including price estimates, descriptions of items and any other information concerning the items, are solely for the purpose of information for potential buyers and are in no way to be construed as stand and/or obligation on behalf of U.T.B. and/or its employees and/or representatives. 3. U.T.B. will appoint a person as manager of the sale (` the Auctioneer` ) who will be responsible on its behalf, inter alia, for the execution and management of the auction. 4. The auction will follow the order of the numbers next to the items as set out in the Catalogue. 5. The Auctioneer, at his own discretion and at any stage whatsoever, reserves the right, verbally and/or by written notice, to withdraw or add items to the sale and to add or withdraw from the Catalogue any information about an item to be offered in the auction on the basis of information received by U.T.B. after publication of the Catalogue. 6. In order to participate in the auction, a potential purchaser must obtain a numbered paddle before the auction which will enable him to bid at the auction. 7.1. On the fall of the hammer and the acknowledgment of the numbered paddle of the offeror by the Auctioneer, the offeror`s offer will be binding and will be considered to be accepted and title to the item will pass to the offeror whose offer was accepted ( `the Purchaser` ), subject to the fulfilment by the Purchaser of all payment obligations to U.T.B. as set out hereunder. In the case of any dispute or disagreement as to the identity of the Purchaser, the Auctioneer will have absolute discretion to determine the successful bidder or to decide to reoffer the item for sale. 7.2. The amount mentioned in an offer at a sale by a Purchaser which is accepted (` the Hammer Price` ) shall be paid to U.T.B by the Purchaser, together with the commission of 18% of the Hammer Price ( the Commission ) and Israeli VAT on commission only. Payment to U.T.B shall be effected immediately upon the conclusion of the auction but, at any event, not later than four business days after the date of the acceptance of the offer by the Purchaser. 7.3. Payments to U.T.B shall be made in cash, or by personal cheque, bank transfer or PayPal. U.T.B. does not accept credit cards. 7.4. An item which is priced in US dollars will be calculated in New Israel Shekels in accordance with the prevailing rate of exchange cash sale as published by Bank Leumi BM on the date of the payment (` the Dollar Exchange Rate` ), but not less than the exchange rate on the day of the auction. 7.5. A Purchaser is liable to pay interest on any delay in payment, at the rate of 2% per month of the amount payable, with adjustments to index-link all outstanding amounts payable to the Dollar Exchange Rate. Interest is payable from the date payment became due up to the date of actual payment. 8. Should the Purchaser fail to pay the hammer price and/or Commission and/or the Vat, U.T.B will be entitled to act as it deems fit to preserve the rights of the Seller, including retention of the acquired item, forfeiture and set off any amounts payable. 9. Some items may be subject to a lower sale price which will be set between U.T.B and the Seller (` the Minimum Price` ). In most cases, the Minimum Price will be below the lower estimate and it will never be above the highest estimate of the item. The Purchaser acknowledges that U.T.B is obliged to the Seller to use its best endeavors to obtain a price higher than the minimum price. 10. U.T.B. is responsible for the name of the artist or the creator appearing next to the item being auctioned. However, all information given by U.T.B., in its capacity as agent for the consignor, is based on accumulated information. It is entirely the responsibility of the prospective Purchaser to check and inspect the items to determine condition, quality, authenticity, size, authorship during the allocated time prior to the auction. The Purchaser may submit in writing, any allegations regarding the origin of an item and/or the identity of the artist or the creator of the item within 21 days of the sale. If it is proven to U.T.B. that there has clearly been an error in the information which was given relating to any item, U.T.B. shall refund any monies paid by the Purchaser and the item shall be returned to the possession of U.T.B. subject to this obligation, the Purchaser shall have no claims and/or further demands with respect to that item. 11. A Purchaser is obliged to collect the purchased item and to fulfill his obligations to pay for the item no later than 4 days from the date of the sale of the item. The Purchaser will be liable for all costs, as determined by U.T.B., which is incurred by U.T.B. as a result of delay by the Purchaser in collecting the item, including storage and security costs. For the avoidance of doubt, the right to possession of the item will pass only once the Purchaser has fully filled his payment obligations as set out in these conditions. 12. Any item marked in the catalog with airplane logo has been imported from abroad into Israel for sale at the auction. Any taxes and/or surcharges and/or other obligatory payments in respect of the sale of objects of art incurred on these items will be payable by the Purchaser. 13. Items bought by a Purchaser who is a non-Israeli resident may be paid for in foreign currency and exported, subject to the provisions of Israeli law. 14. U.T.B. will represent, free of charge, potential purchasers who do not wish or who are unable to attend the auction. These potential purchasers are requested to complete the Rights to Bid form in the catalog, no later than one day prior to the auction. U.T.B. will not be liable, under any circumstances, for any error, omissions in connection therewith. 15. Any potential Purchaser who wishes to participate in the auction via telephone or internet shall make the necessary arrangements within a reasonable time before the commencement of the auction. U.T.B. will not be liable under any circumstances for any error, omissions in connection therewith. 16. Any reference in this Agreement to the singular shall include the plural and vice versa, and any reference to a person shall include a body corporate and vice versa. 17. The courts of Tel Aviv-Jaffa, Israel, shall have the sole jurisdiction in any dispute between U.T.B. and the Purchaser or any potential Purchaser, based on the details of this agreement and/or related to the sale and/or to the transfer of any item. 18. These conditions constitute the entire agreement between U.T.B., the Purchaser and/or the potential Purchaser, and include all understandings, agreements, liabilities, and conditions between the parties. 19. Any changes or additions to this agreement shall be in writing, and if not, such changes shall not be effective. 20. These conditions override and cancel any other or prior agreement between the parties. Please request shipping quotes upon receiving you the draft invoice. 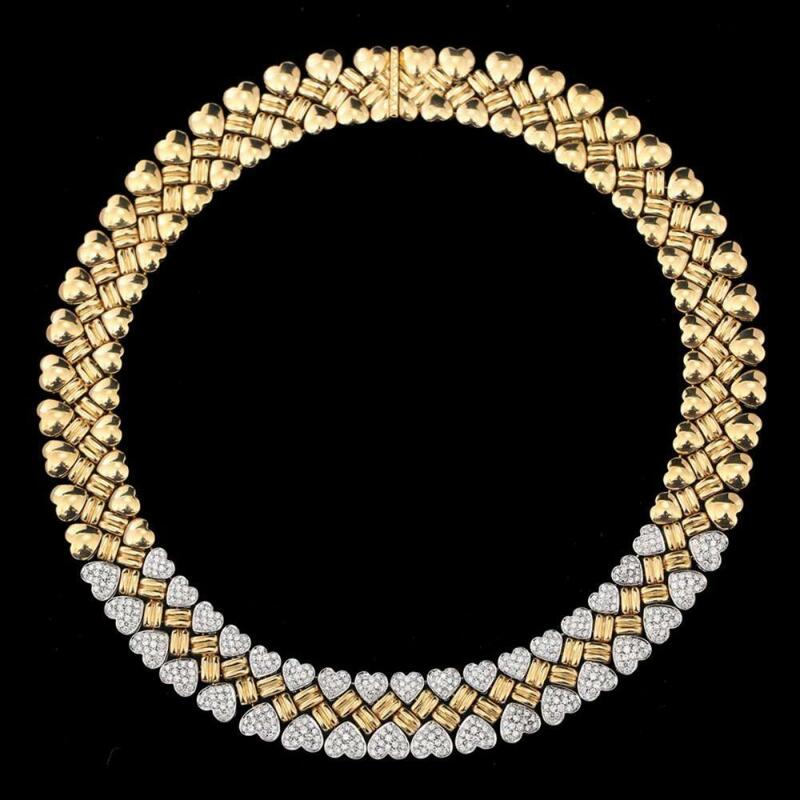 Description: twisted rope chain, composed of a yellow gold chain and a white gold chain. Weight of necklace is approx. 43 grams. Description: each composed of two types of decorated links, and a lock shaped decorated pendant, each set with a central oval Amethyst. Description: Composed of 3 colors of gold links. Weight of necklace is approx. 24 grams.